TFCP stock office bin liners, tidy bin liners, light and heavy duty plastic garbage bags 55lt to 82 lt, bin liners for small (120lt) and large (240lt) wheelie bins. There are two types of plastics used in plastic bags; HDPE, a crinkly sounding bag suitable for light trash, and LDPE, a shiny bag used for heavy waste. The HDPE bag has a tendency to “split and run” and the LDPE plastic bag has more tear resistance in it. The U.M. indicates the thickness of the bag therefore a combination of high U.M. and LDPE makes for a strong, heavy duty bag. For example, a washroom would use a HDPE bag because most of the rubbish is paper waste and a kitchen, bar would use a high U.M. LDPE bag. 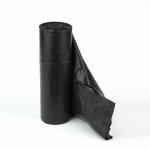 The difference between a plastic garbage bag and a bin liner is the method of use. A tidy liner, garbage bag is made to be lifted out of a bin and discarded while a bin liner is usually “tied off” and emptied out of the otto bin due to the weight of the waste. 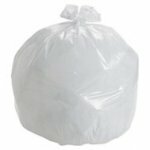 Contact us and we will advise and help you find the correct plastic trash bag for your requirements. Remember the GST is included in the price.